‘Measure What Matters’ sets out a deceptively simple technique for driving forwards company performance and culture using a system of ‘OKRs’, objectives and key results. It purports to have been the makings of many a unicorn and it packs a punch. Now I can tend to be a little on the fluffy side of business. I’m schooled in (too much?) HR and people-training. I’m (unfairly?) averse to Americanisms and almost any story out of Silicon Valley. The number of my toes that curl is in direct correlation to the number of (inaccurate?) mentions of the word ‘disrupt’ or ‘hard target’. I read this book – highly rated elsewhere – to escape my own echo chamber. Because we know that HR needs to ‘get’ business. As an HR professional or leader, I recommend ‘Measure What Matters’ in a couple of contexts where it will add high value. If you’re in a position of influence such as to introduce a new performance management culture from the top down and can direct that strategy, then I’d buy into OKRs. Be warned if you read you may well buy in and if you cannot then deliver, there is potential frustration. This works if you want to look at your HR leadership language and style and you are real about appreciating a different approach. Because travelling through the chapters of Doerr’s writing and you’ll also appreciate that whilst the approach may differ, the end goal is the same. OKRs aim to achieve business outcomes through inclusive, continuing and engaging commitment from employees from the bottom up. And preferably plenty sideways too. What are OKRs and what do they do? At first you may, like me, question whether this is simply a grander way to style up SMART objective-setting, but I’m convinced it does go significantly beyond. An OKR is an objective, defined by between 3 and 5 outcome-based key results. Those results must be not only necessary but sufficient in describing success. Focus top-down OKRs by answering the question as to what is absolutely the most important thing to do. The aim is to engage everyone’s attentions in just a few single directions. And then to allow individuals or teams across the organisation’s network to set their own stretch targets. 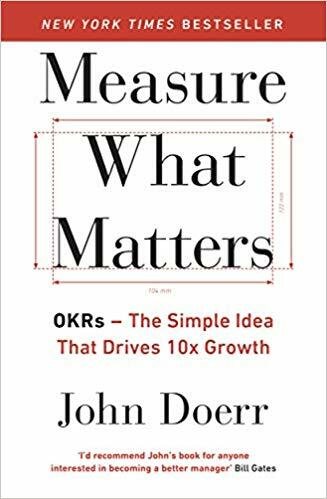 John Doerr is a venture capitalist, who has invested in big name successes, not least Google which is the first of the stories compiled for his book, to interrupt explanatory chapters about the OKR approach itself. The contrasting on-off from textbook to story is effective as a structure and makes for easy reading. In 1999 the author introduced the tactic learned in his time at Intel to Larry Page (who writes a foreword) and Sergey Brin. Later on we hear about examples from the Gates Foundation, Adobe, YouTube, MyFitnessPal and (more) Google. You’ll get the kind of context. At the back of the book is a very useful set of resources, including the Google Playbook for OKRs as well as a summary of the book’s content – don’t overlook this section. It can be clouded by the effect of style and context, but importantly ‘Measure What Matters’ is a very human view of organisational performance. HR should like it! Part 1 sets out the method, with examples. Part 2 considers the New World of Work and helps you to shift from annual performance review cycle to continuous performance management and get rid of a command and control culture. I review business books frequently and rating is always hard. For content I’d go for a 4 or 4.5 out of 5 and I’m deterred purely on style. For example, I’ll gladly support ambitious aims for an organisation but I could do without the x10 Growth or the BHAG (Big Hairy Audacious Goal). Is the OKR technique really an all-or-nothing commitment? I think not. I am all for translating concepts into something that makes practical sense for you. Consider a read to take away a few learning points about how to improve upon your SMART goal setting. Or read the book if you’re a fan of Bono. Learn about U2’s brazen ambition and his belief in ‘factivism’. Personally I’ll take the lyrics of ‘Measure What Matters’ but sing them in a different key.